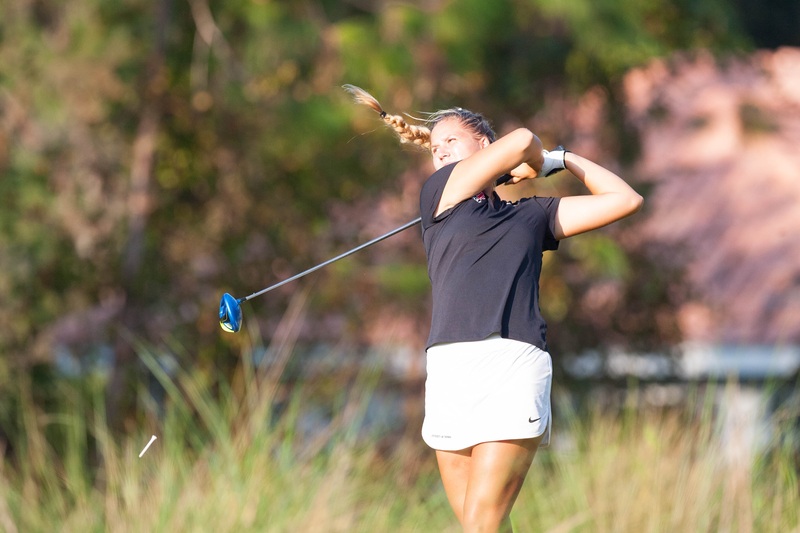 Last week, UT’s women’s golf team placed third at the Saint Leo Invitational in Dade City. Sophomore Kiira Riihijarvi was the individual champion during the match. This is her second tournament championship, which happens to be the only two the program has ever had. The All-American not only battled for the trophy, but she also broke UT school record, that was previously set by her last year at the 2016 NCAA South Regional. Riihijarvi set the record at a 70 last year, and hit a 69 last week, knocking one point off. During the tournament Riihijarvi and Nova Southeastern’s, Michelle Ruiz both tied the first two rounds and then moved to playoff holes to determine a winner. “It’s a very nerve racking situation to be in”, says Riihijarvi, “Every shot counts. If the other hits a lower score on that hole you lose.” Both women tied the first playoff hole and in the second, Ruiz hit a par as Riihijarvi finished the match with a birdie. “My coach helped me a lot during this time, she talks to me, distresses me, and tells me to breathe and do everything I know I can, and do not change anything or let my mental get to me.” says Riihijarvi, “she’s an awesome coach and I have a lot to thank her for!” After setting a second record here at UT, the athlete has high hopes of continuing to break the score and see what else the year will bring her. Along with her team, “Our team is doing very well this season, we just got a great ranking in the nation and hopefully we can act upon this when the time comes.”, says Riihijarvi. Riihijarvi began playing golf when she was ten years old and hit it from there, playing in her hometown Oulu, Finland. There Riihijarvi played at the Finnish Ladies Amatuer Championship and was the top ten finisher. She then moved her senior year of highschool to Georgia to play for an academy. Riihijarvi also began a fantastic freshman season last year as a Spartan, winning the NCAA Regional Tournament shooting rounds of 78, 72, and 70 and finished ahead of the National Champion from Saint Leo. Riihijarvi also competed in Ohio at the NCAA Division II Championships and ended up placing 9th in the nation. Riihijarvi’s also a very consistent athlete she finished in the top ten at four tournaments last year as well. She also plays year round and trains hard of the summers and year on a strict training plan to strategies well, “I practice for two-five hours a day depending on what point of the season I’m in. We do anything from hitting, driving range work, to putting. We also practice on a lot of different courses to get some variety in”, says Riihijarvi. She also adds, “The team structure is different this year, last year we were playing good but didn’t get very many results, so it’s nice to finally see the team getting results and recognition.” In fact, the women’s golf team was just recently ranked 25th in the nation. This is the first ranking the program has had in the top 25 in the Spartan’s history. The team is on a good route, especially with Riihijarvi on their side. So what’s next for the powerhouse of Women’s Golf? “My goal this year would obviously be to continue to be an All- American at NCAA championships, and I’m hoping to be named Player of the Year in May”, says Riihijarvi.